As the Fall semesters come to an end we wanted to give a quick update on CO:de Catalyst, our program for high school students working in a class or a club to utilize a web platform to teach them how to code to build websites and apps. The web-based program gives them an opportunity to learn as much as they want in several different computer languages, they aren't bound by time in class or in a certain physical space which leaves the ball in their court to see how much they can learn. We have been wowed by some of the students and to reward them we sent each of their teachers 2 gift cards to Best Buy to be given to the students that stood out the most to them in their class or club. Below are pics of a few of the students. Congratulations to Max Maples and Hailey Yodushock! Max is always offering technical support and helping others in class and Hailey headed up the Hour of Code and created a template for the to use at that event. Congrats to Houston Hickerson and Maria McConkey, both have set great examples with their work habits, motivation and coding skills. Dhandray Carpenter and Kobie Winston were the winners at Liberty. Dhandray earned the most badges (within the Treehouse program) over a 2 week period and Kobie is the top badge earner in their school. Congratulations to Quantum Green and Nicholas Pica-- they were spotlighted for exceeding their badge goals. Congrats to Kaylan Phillips and Nilza Martinez-Romero, they have done an outstanding job learning about coding through this semester. Code Sadler and Tyler Burk were the winners of the gift cards in this Middle TN school. Cole loves the program and does an outstanding job helping other students through coding education. Tyler has had a great attitude this semester. Congratulations to Precious Shutes and Contra Morton, both girls have shown great potential with coding this semester and Contra has earned the most badges throughout her school. 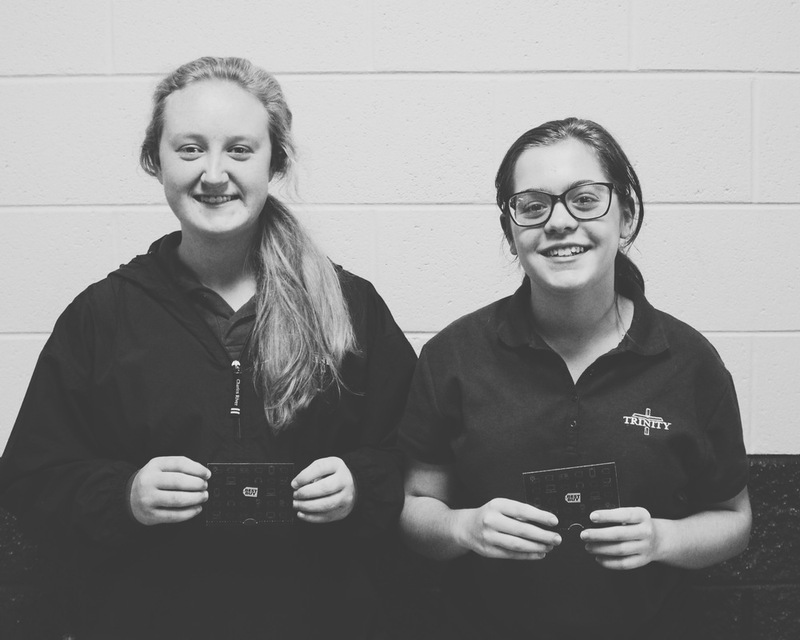 Abby McCalmon and Ashley Watkins were the gift card winners and both girls were the highest in badges, quizzes and points earned in the TCA club. Congrats to Evan Patterson and Larissa Rose! Evan earned the most badges in a week and Larissa has the most badges at USJ! Also-- huge thanks to the amazing teachers that are bringing this program to life: Kim Colbert, Vicki Deloach, Joe Grapes, Tim Grapes, Susan Mauney, Bridgett Morrison, Donna Newberry, Jeff Replogle, Kelly Shanks and Lea Ann Smith. If you are curious about how to get CO:de Catalyst up and going in your school, contact us!